Even though I won’t be there, I am excited to see that Kamel Daoud will be one of the featured authors at this year’s Hay Festival. His novel Meursault, Contre-Enquete is moving and important. It’s been reviewed from all possible angles in recent months, and deserves every bit of that attention. As soon as I saw its title, it brought me back to a time and place – my years as a French Lit major – from an entirely new angle. Sure, I’d had many late-night student discussions about the fact that Camus, the noble Camus, the great humanitarian in a trench coat, had not even deigned to give “the Arab” a name. And yet, until now, no one has written a book about it; the idea alone is worth all the literary attention! My heart ached as I heard Feraoun say those words, and that night I reread his first novel, which has always remained my favourite of a very long list of great Algerian books. The poor man’s son of the title is Menrad Fouroulou – the coddled only son of a sensitively portrayed family in a Kabyle village in the mountains of northern Algeria, years before their war for independence. Written in a disarmingly simple style, full of charm and intelligence and an deceptively deep sense of humanity, it is the story of young Menrad’s struggles to overcome the confines of his village life, and to go on to higher education and the life of a teacher within the French colonial administration of the time. It’s a universal tale, one that hovers between a novel and an autobiography, and one of the first novels written in French about Algerian natives with respect and sensitivity. And it’s delightful, full of humour and poetry. It is not a revolutionary novel by any means. A new edition of the book, however, has reinstated two sections, on the war, and an epilogue, that were censored in the original edition. Feraoun went on to write several other highly acclaimed novels, as well as a Journal that is tragic in its beauty and humanity. But history consigned him to straddle two worlds – the Arab/Kabyle world of his people, and the colonial world of the French – and his own nature consigned him to a yearning for peace and understanding beyond all revolutionary fervour. So when I heard what he had to say about Camus, I felt shaken. In the end, as a French Algerian (pied noir), Camus could not bring himself to support the Algerian struggle for independence. But Feraoun chose, nonetheless, to see him as a friend and supporter, to see the best in Camus, as he saw in all the villagers of Le Fils du Pauvre. A conversation with the author of “perhaps the most important novel to emerge out of the Middle East in recent memory” (FT), winner of the Prix Goncourt du Premier Roman. Daoud’s protagonist is the brother of “the Arab” killed by the infamous Meursault, the antihero of Camus’ L’Etranger. 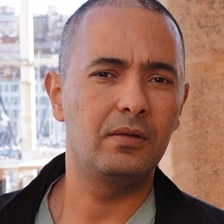 Angry at the world and his own unending solitude, he resolves to bring his brother out of obscurity by giving him a name – Musa – and a voice, and by describing the events that led to his senseless murder on a dazzling Algerian beach. The Meursault Investigation is a profound meditation on Arab identity and the disastrous effects of colonialism in Algeria.